The one pictured above is designed by Marco Zagaria as a finished product, but we (like many others) are making ours out of plant pots. It’s very simple and I’ll be doing my best to explain how it works afterwards. Place the rack on top of the tray. Place candles in center of tray. Cover the candles (lit) with the upside down smaller pot (remember to cover the hole if necessary). Cover the upside down smaller pot with the upside down bigger pot. It really is that simple, and in my experience makes quite a difference in tight quarters, but do make sure you have a carbon monoxide indicator if you’re burning candles a lot in a small space. The base: It’s not that important what it’s made of as long as it’s heat proof. Other options are deep plates, wide shallow bowls, stone bakeware, baking tins, etc. In any case, please stand these heaters on a surface that won’t scorch, or put the whole thing on a base of tiles (glazed side up) to avoid any safety issues with the heat. The rack: You could use an oven shelf, BBQ rack, old gas hob parts, a bicycle sprocket, or anything that is heat proof and allows air through it. The main purpose of a rack is to lift the pots creating a gap that cold air can be sucked in through during the convection process (see ‘how it works’ below). You could even remove the necessity of a tray altogether by standing the pots on ‘feet’ such as bricks, or using different shaped base (see ‘examples’ below). For a single pot version even something tall like a metal cutlery holder would do the trick. 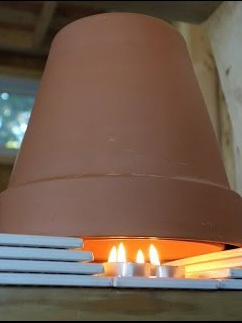 The pots: Bigger or smaller sizes, or multiple heaters can be used depending on the space. 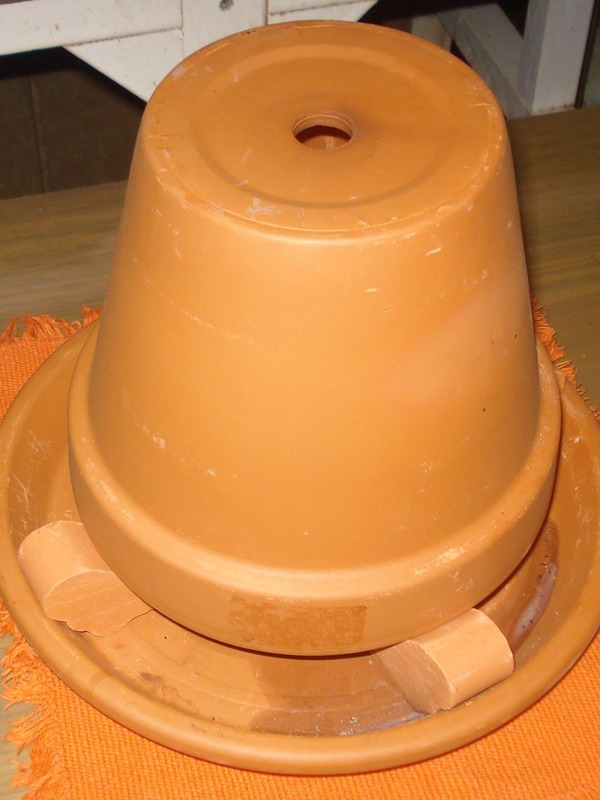 You can also remove the smaller pot for a single pot version. 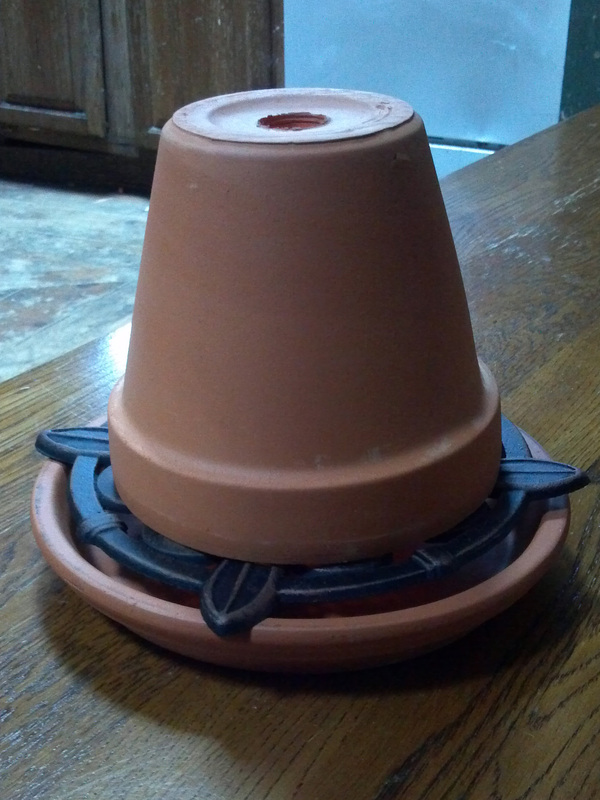 While the double pot version is more effective for longer use, for shorter use the single pot version heats up faster. The candles: While tea lights are most commonly used due to their inexpensiveness, other candles are as effective and those without paraffin are more environmentally friendly. First let me briefly and simply explain three main principals of heat transfer. Heat is thermal energy. It can be transferred from one place to another by: conduction in solids, convection of fluids (liquids or gases), and radiation through anything that will allow radiation to pass. If there is a temperature difference in a system, heat will always move from higher to lower temperatures. Conduction: Conduction occurs when objects of different temperatures come into contact with each other. Conductive materials conduct heat well, insulating materials obstruct the conduction of heat. Convection: Convection occurs when warmer particles of a liquid or gas rise, displacing cooler particles in the liquid or gas. Radiation: Radiation is a form of energy transport consisting of electromagnetic waves traveling at the speed of light. No mass is exchanged and no medium is required. So what does this mean in our heater? Convection and radiation are already in existence if you just burn a candle. The heater simply makes use of these processes to create a heat source that is more effective at heating the air in the room rather than the surrounding surfaces, such as walls. Convection: The image above shows how convection affects the airflow within the heater. The candles heat the air in the small pot, convection pushes the hot air out of the small pot, into the big pot (the first available space for hot air to rise), and out through the hole in the top. At the same time pulling cold air in through the space between the pots and the tray. This creates a circulation of cold air being taken from the room and warm air being released back into the room. Radiation: This image shows how thermal radiation interacts with an object. Terracotta (the grey in the image above) temporarily absorbs some of the radiated heat (red) from the candles, resulting in less heat being transmitted (purple) to the next surface. First, if we look at the process of thermal radiative transfer doubled we can see how creating two barriers for radiated heat to pass through results in even less heat loss and more storage. This is radiated heat remember, heat that would transfer to the next surface, not the air. The intercepted heat is stored in the pots. Second, we need to remember heat travels to cold, but also, that the rate of heat transfer decreases as temperature difference decreases. 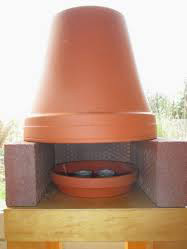 So by having the two pots and creating a pocket of warm air, we have hot next to warm rather than cold, which slows thermal radiation (loss of heat) from the small pot. Third, the heat that is stored in the pots would eventually radiate out, but because it is temporarily stored it gives the air flowing through the heat pocket time to convect the heat into the room’s air. So, if we combine the effects of radiation and convection in this scenario, what results is a higher ambient temperature because we are losing less radiant heat and aiding convection. This all sounds great, but … there’s some additional things to consider when deciding whether to use the candle heater or just burn a candle. Firstly it depends on the amount of time you want to warm the space for. If you compare the air temperature differences of the heater or just candles by themselves, the difference is actually minimal, in fact it takes a little longer for the air to warm up with the heater, this is because the heat is first being absorbed by the pots for a while before they start aiding heat production. So why bother? Well the differences between naked candle and heater are more noticeable over time, for example once the candles run out: with bare candles the air temperature drops very quickly (air doesn’t store heat well), however with the heater all of the stored heat is slowly released. Meaning that even after an hour the air temperature is about double what it would have been otherwise. In other words, the overall amount of candles needing to be burned is reduced. Secondly you have to look at something called ‘comfort temperature’ rather than ‘air temperature’. Comfort temperature combines air temperature, air speed, and local object temperature. Comfort temperature has more to do with how warm your body feels than how warm the air actually is. If you look at the comfort temperature area surrounding the heater it is much larger than the area of air heat the heater provides. What this means is that you will feel more body warmth near the heater than you would get just from the air temperature warmth. Sources: For thermal transfer look here, and here for rates of transfer. If you want to read more about heat and this heater check out Robin’s series part 1, 2, 3, 4, 5, & 6. He made the convection image above and explains the whole process in a lot more depth than I can.